Posted on January 24, 2017 at 10:13 am. Online gambling in the US isn’t clear cut, but some states have regulated Internet poker and it appears New York is next in line to do so. The bill to legalise online poker in NY could pass in 2017. While there was some movement in terms of legalising online poker in the state of New York last year, Assemblyman for the 89th District and Chairman of the Racing & Wagering Committee Gary Pretlow has told Gambling Compliance there is plans for it to be reintroduced. Pretlow, who chairs the Assembly committee on gambling issues, said he had recently had a meeting with the New Jersey Division on Gaming Enforcement (DGE) to address issues which had seen the bill thrown out last year. This included problems Pretlow himself had with player security, collusion and safety in an online gambling market. The bill, proposed by Senator Jon Bonacic, passed the state senate by a large majority in June last year, but Pretlow announced it was dead immediately after. This saw any hope for online poker to be made legal in New York dashed. This time it seems Pretlow will offer more support than he previously did, with solutions from the DGE addressing his security concerns. This support will mean Bonacic’s bill will easily pass the upper chamber and online poker in New York will become legal in 2017. Interestingly, Pretlow also has plans on legalising sports betting in New York, with a proposal which would challenge US federal law. The Professional and Amateur Sports Protection Act (PASPA) was created to stop the spread of online sports betting and makes it makes it very clear new states cannot make the gambling activity legal. New Jersey is already fighting the law which only allows single-game wagering in Nevada, and now Pretlow wants to take it on. He spoke to Law360 about why he thinks sports betting should be legalised. “The fact of the matter is that billions of dollars are being wagered,” he said. “A majority of those dollars are going to entities that we don’t associate ourselves with. “I think that if people are doing it that it should be controlled. This argument is hopefully one Pretlow has jumped on board with when it comes to online poker, which would mean the bill would get over the line and become legal. This could perhaps also lead the way for all Internet gambling, including casino gaming. If so, 2017 will be an incredibly interesting year for New York. Can Americans play at online casinos? 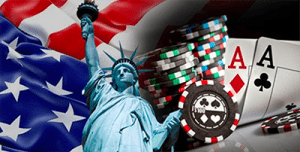 The United States has some seriously strict online gambling laws, but that has not deterred many offshore casino sites licensed and regulated overseas to service USA players. Always make sure to brush up on the current legislation in our provided guides so you aren’t caught off-guard and remain an informed real money player. All of our readers from United States can safely (and legally) play at Raging Bull Casino for real money bets – sign up for an account via our site to kick-start your account with generous sign up bonuses and other promotional rewards.